I felt bad from the beginning (the bad beginning, get it? :)) for the children. All they experienced was bad thing after bad thing after bad thing. Losing their family, losing their home, having to live with an extremeley terrible uncle they don’t even know. I wouldn’t know what to do. Violet, Klaus and Sunny were so brave for trying to conquer the situation they were in. 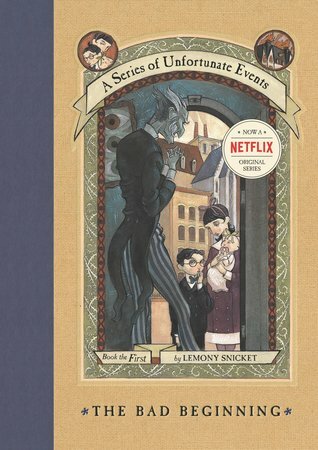 This series being for children, I can image the books being scary to them. The way Count Olaf mistreated the the children and the whole ignorance of the children’s situation was heartbreaking and miserable. It made me a little bit annoyed that all the adults in this book were so blind to the situation and the sadness of the children. Overall the book actually made me a little sad and miserable. Like Lemony Snicket actually said. I was surprised by the fact that these books are so different than other children’s books. All the children’s books that I see these days and that I read or saw when I was younger were always happy books or at least books with a happy ending. This is so different in the way that the back perfectly describes what the book is: unpleasant. Don’t expect happiness and wonderful endings.